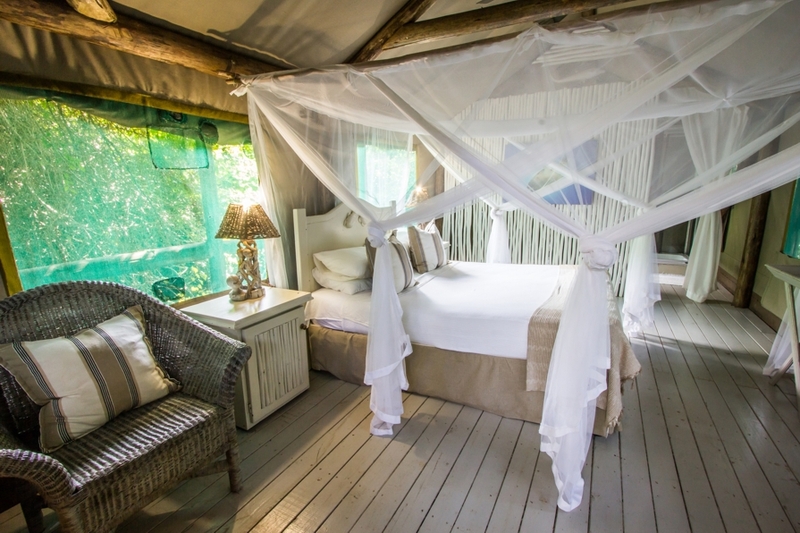 Situated in the extreme south of the pristine Mozambique coastline, alongside Ponta Malongane (16km from the South African border), our private and exclusive self-catering luxury tented camp offers comfort, privacy and tranquillity to the discerning nature lover and adventurer. 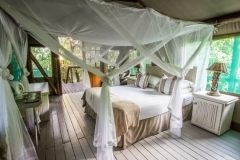 Tartaruga luxury tented camp is perfectly designed to blend into the surrounding coastal forest. 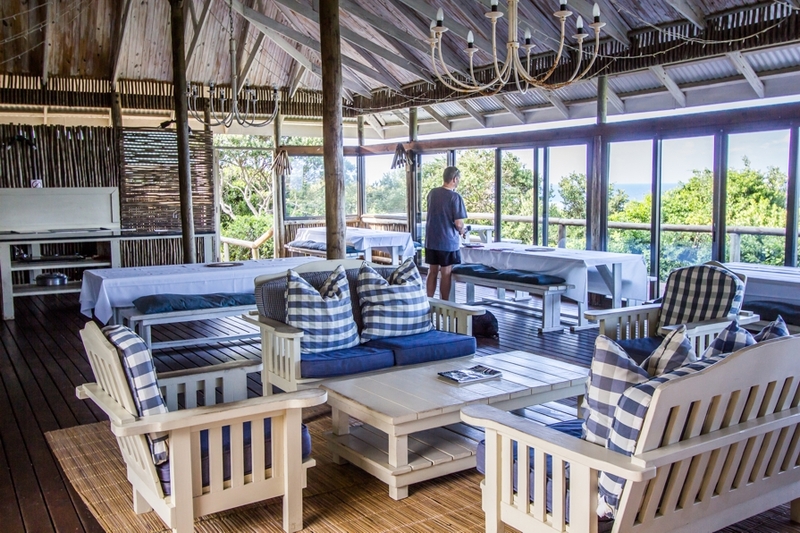 The tents are housed on raised wooden platforms with veranda decks furnished with chairs and tables. 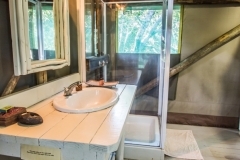 offering an excellent hideout for birding or just enjoying the tranquillity of the camp. The camp consists of eight suites (five double tents, two three-bed tents and one three-bed log cabin). The interiors are luxuriously appointed with all the home comforts. 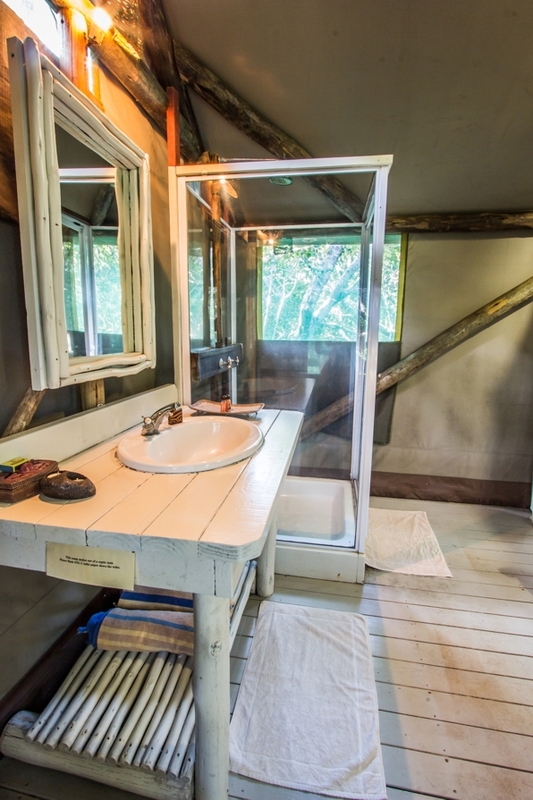 Each tent has an en-suite bathroom with hot and cold running water, comfortable beds, mosquito netting, a discreet overhead fan as well as an electric kettle and coffee and tea-making tray. There are electric plug points for the use of the guests. For your peace of mind, all suites are equipped with in-room safes for the safe-keeping of cash, travel documents and other valuables. Northern KwaZulu-Natal and southern Mozambique are considered a low-risk malaria area. The risk of malaria infection is much higher in the warm summer months as opposed to the cooler winter months and similarly the times around sunset and sunrise the higher risk times. We advise taking the necessary prophylactic anti-malaria precautions and consulting your doctor in the event of any strange flu-like symptons developing after your return home. Check with your Medical Aid or medical rescue plan if they fly into southern Mozambique (across the SA border) in the event of a medical emergency. The area has limited medical facilities and the closest hospital is at KwaNgwanase in South Africa. Tartaruga Maritima provides a romantic venue for memorable weddings where the party doesn’t need to end after the reception. If you’re planning your Special Day and you’re looking for something a little exotic where your friends and family can come together for an extended celebration in a relaxed and informal setting, then Tartaruga has a surprising amount to offer the bride and groom-to-be. Tartaruga can host intimate wedding parties or receptions for as many as 50-60 guests – all accommodated in Tartaruga Maritima tented camp or in alternative accommodation within walking distance! Some brides choose to tie the knot on the beach but the forest is just as romantic (and more protected from unpredictable weather fronts) and the village overlooking the inland lakes behind Tartaruga makes a stunning backdrop with the late setting sun for colourful wedding photographs. Tartaruga Maritima can provide enough seating for 60 guests at tables covered with white table cloths. If you would prefer a different colour scheme you will need to bring the cloths with you. You will also need to bring any table decorations you would like on the tables. Brides often choose to keep it simple and have come up with resourceful table decorations using little more than beach sand and candles. It’s entirely up to you. We work closely with a wedding planner based in Ponta do Ouro, Leanne Mould, and she has expert advice on where to source ice, musicians, table decorations, photographers, barmen, caterers and whatever else a bride needs. We have also put together an eight-page wedding brochure to assist brides with planning their Big Day. There is a health spa a five-minute drive from Tartaruga where the bride and her bridesmaids can have their facials and pedicures. There is however no hairdresser in the area. 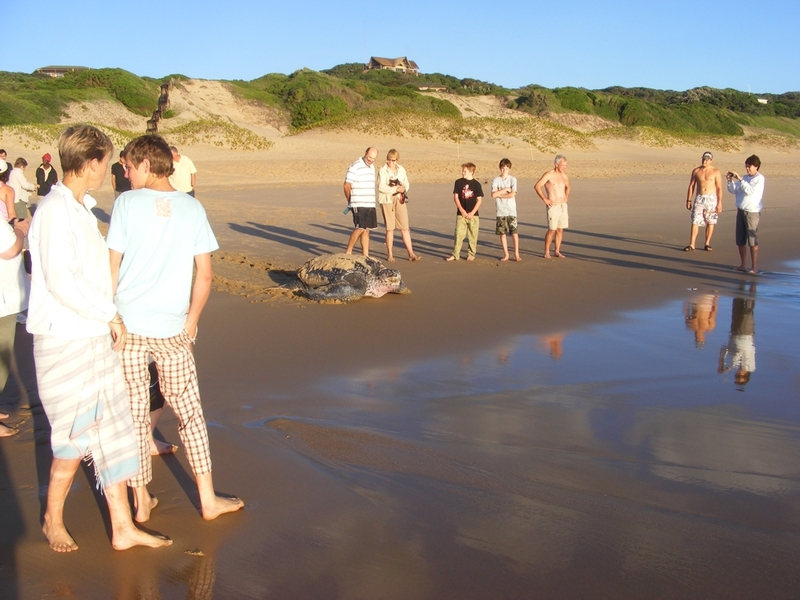 Guests without 4X4 transport will need to arrange border transfers beforehand with Tartaruga. As Tartaruga Maritima is in Mozambique, there are several important matters that need to be attended to by non-Mozambique citizens wishing to get married. Non-Mozambique citizens cannot get legally married in Mozambique. Couples will need to get legally married in their home country and then perform the ceremony or just celebrate the event at Tartaruga. If you have a marriage officiator whom you would like to perform the ceremony, you will need to arrange for him/her to travel to Tartaruga. 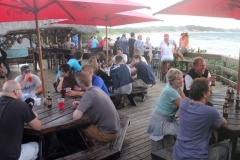 Bringing a large amount of alcohol into Mozambique may require the payment of a border tax, but drinks can be arranged at competive prices through a local supplier. We will require advanced notice of this order with a list of any specific wines you may want to serve. 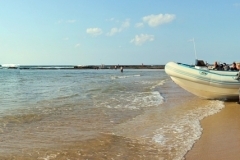 If you do want to have the event on the beach you will need to first get permission from the Port Captain in Ponta do Ouro. 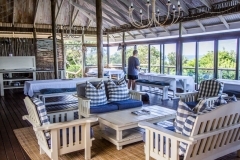 There are several surprisingly good restaurants either in Malongane or in neighbouring Ponta do Ouro and they are well worth trying – not only for their exotic fare but also for their beautiful and relaxed settings. 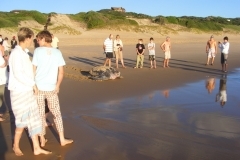 ‘Come to See’ is situated in the local village and is within walking distance of Tartaruga. 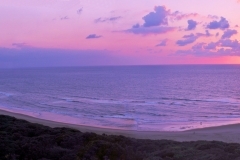 Prawns, calamari and Portuguese chicken are but a few of the local dishes offered while guests watch the sun set over Lake Sugi!